The New Year is one week old…do you know where your Resolutions are? You’ve hardly gotten around to sweeping up your New Year’s eve confetti, and self-help experts are on Resolution-making like a pair of skinny jeans—most of them implying that if you’re not trying to improve your life in some way (with not just one Resolution but several) your future as a functioning human being is in doubt. If that’s not enough pressure, there's all kinds of advice about what to do when you can’t stick to your Resolutions (there’s no “if”—you’re only human, right?) so failure is already built into the system! Most of what’s out there we’ve all seen before. Like, instead of setting an intention to stop a behavior, you should make it positive. Example: don't say to yourself, I will stop eating so many Lindt milk chocolate bars, you think, I will improve my health. Still other goal-setting gurus suggestions: make your goals realistic and specific; partner with someone who shares your resolution; when you slip up, just keep going. All good advice…but not so inspiring. Seeking more pizzazz when it comes to making resolutions, I found a sampling from the Seattle chefs' community: "To eat not standing up at least four times a week." "Exercise more so I can drink more Champagne," And, "Practice doing cartwheels more with my 8 year old daughter so I don't hurt my back every time I try one." (Thanks to "New Year's resolutions from 17 Seattle chefs," by Bethany Jean Clement, Seattle Times, January 1, 2017.) Fun resolutions, even if they won't quite set the world on fire. Hoping for an epiphany, I kept looking for some Resolution advice I could really get excited about. O Magazine columnist Martha Beck focuses on what you might call "Non-Resolutions" (January 2017 issue). Her approach includes a few nuggets: Resolve not to lose weight but to gain "weight" by adding more meaning to your life. Instead of vowing to declutter your house, embrace the chaos. Rather than saving money, "spend" more positive attention. Definitely a new twist. Gigantic garlic from the garden! I was all set to make my new Non-Resolutions, then I found some even better advice: give yourself a theme for the New Year. After many years of making, then breaking my Resolutions, I’m going with this one. Out of the many self-improvement goals/themes I could undertake, and there are many, I came up with one that covers everything: Take More Chances. If you’re a risk-averse, creature-of-habit homebody like me, you know an intention to go for the gusto is a major stretch. Just this week, however, I “lived dangerously” by taking two completely new risks. One wasn’t all that successful; still, I’m glad I tried it and I’m going to give it another go and see what happens. The other risk paid off. Emboldened by my most successful garlic harvest ever, I lined up a "backyard farming" teaching gig for this spring! The morning after I made my Resolution, I reached into the new package of tea for my wake-up hot beverage. If you drink Red Rose tea, you know each package includes a miniature ceramic figurine, part of a collection with such themes as the circus, nautical items, wild animals, and so forth. 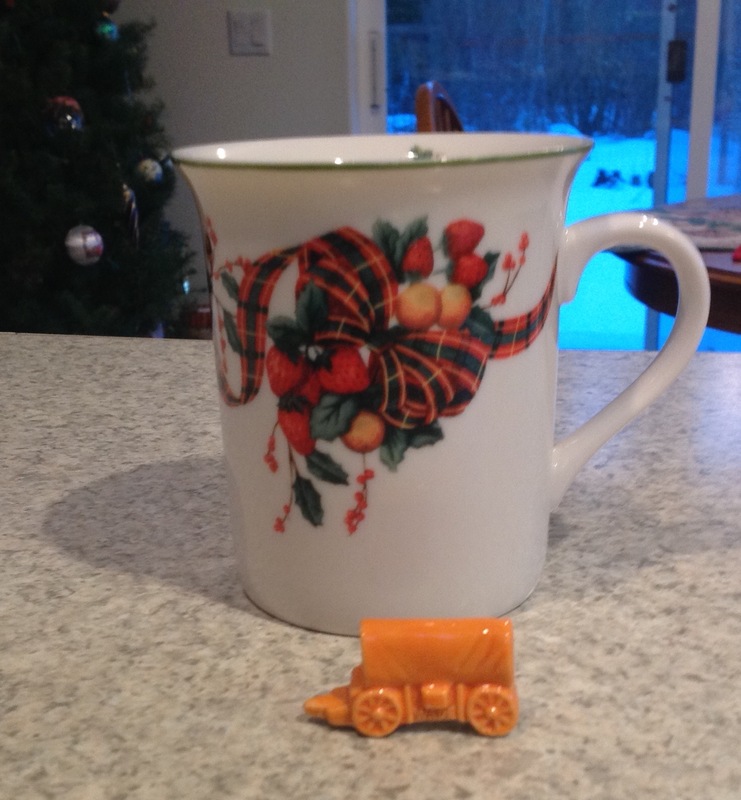 Interestingly, I found a small orange covered wagon! The serendipity of making my "Take More Chances" resolution, and coming across the symbol of those ultimate risk-takers, pioneers, hinted that I was onto something. Here's to more nerve for us all! Happy New Year!